An Amateur Radio Technician License class is currently in progress. You can still join in for the remainder of classes, see below for details. We will begin a General License Class around September 29, 2018. Check back here for details as they develop. Morse Code Tutor Project: While a Morse Code test is no longer required for any level of Amateur Radio License, it still remains a popular mode. We now offer the "Morse Code Tutor Project". Follow the link above to learn CW with a 9-week self study course. Do you want to become a Ham Radio Operator? This class is co-offered by the FRRL and the Bolingbrook Amateur Radio Society (BARS). Download the flyer on the right. Address and interactive map are at the bottom of this page. 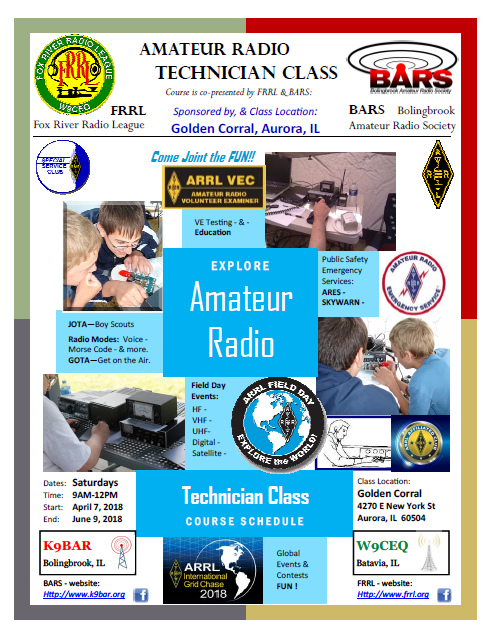 The Fox River Radio League (FRRL) is joining together with the Bolingbrook Amateur Radio Society (BARS) to co-present a NEW – Amateur Radio Technician Class license training course this spring. This course is a FREE 10 week course. Where you will learn everything you need to receive your new Amateur (Ham) Radio Technician Class FCC radio license. This class is designed for people, who are new to the hobby, and are interested in finding out more about the world of the Amateur Radio. There is no prior license required. There is no age limit. There is only the need of interest in the Ham Radio hobby, and a willingness to learn. Be prepared for both interactive, group and individual study. There will be a VE test license exam on the last week of the course. But not to fret, the Technician Class course itself provides you with all the knowledge and information that you’ll need to pass the exam. Invite your ‘Want-a-Be’ HAM friends, your Spouse, your Children, Nieces, Nephews, or Grandchildren. ANYONE is invited to join the class or “sit in” as a refresher. If you’ve EVER had an interest in Amateur Radio, attend this FREE course, study and get your Amateur Technician Class license! 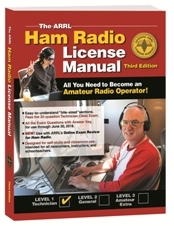 The textbook for the class will be The ARRL Ham Radio License Manual, 3rd Edition. Be sure you have a copy before the class. Books can be purchased online through www.arrl.org at local hamfests, or other online sources such as Amazon, and Kindle. Additional study material will be given to you at the classes. After receiving your ARRL Ham Radio License Manual book, be sure to review the book and read the first chapter. To be ready to dive into learning at the first class and to ask questions.